Uncategorized | Moms-Pod – A blog. I will never forget watching the Judge in the Michigan Court convict and sentence USA Gymnastics doctor and serial predator Mr. Larry Nasser to life in prison. I will also never forget watching those survivors in the Court room that day and the Judge reminding us that “It’s Their Story”. Now you have the opportunity to see firsthand those brave survivor’s stories and their courage up close and personal. While it may be hard to watch, this powerful documentary is a must see for all. It will take your breath away, and may even make you cry, but it will also empower you to raise your voice and take action and will restore your faith in humanity. Ultimately, it will bring truth to power. This documentary educates and inspires us with this unbelievable true story of hope. I pray it will create a dialogue so that future generations’ hearts can blossom in Gold – which is the ability for us to simply be our best. GSD is also creating a powerful educational program called “Courage First” to insure that future generations will be given the tools to use their voices to keep them safe. The Courage First educational program will be launching soon. If you are ready, willing and able to watch this powerful documentary, can you take a pledge to join Courage First and to help put an end to abuse and bring respect for once and for all? How did this film come about and why is this film the first out of the can, so the speak? Global Sports Development founders, Dr. Steven Ungerleider and my husband, David Ulich, are more than just advocates. They are mavericks and disrupters who help survivors of abuse and injustice bring truth to power. GSD has a 20 plus year history of bringing justice and hope to Olympic athletes, their families and the world, and they were already working to help various gymnasts in 2015, well before the 2017 conviction of Larry Nasser. “In 2001, The U.S. Olympic Committee admitted — after a 12-year effort by DeMont to clear his name — that it had erred in its handling of DeMont’s medical information at the 1972 Olympics. DeMont had disclosed on his medical statement that he was taking the drugs Marax and Actifed for allergies to wheat and fur. While the USOC’s settlement with DeMont acknowledges no wrongdoing and does not contain an apology, it seems that in the best case doctors for the USOC would have told him that those drugs contained banned substances. I am blessed to live here in Malilbu, but today, on a rainy Valentine’s day there is a flash flood warning. I am alert, grateful and hopeful. Many in Malibu are hurting, but many are also helping. Many have lost homes, and my heart still aches for those suffering. Some are threatening recall and reckoning, but this letter isn’t about anger, hatred or retribution. Today is about LOVE for all of Malibu – the place, the people, the poison, and the passion that lives and grows here. It is an honor to witness firsthand the awesome power of Mother Nature. We have fires, we have floods and we have fabulous too. In the morning and afternoons, we get to witness breathtaking beauty as the sky glows with red, orange, pink, blues, purples and grey. Each day we get to wake to God’s/Mother Nature/the Divine’s, new painting. If you take a moment to breath it all in – it may warm and cleanse your heart and soul like the rain falling today that washes away the ashes. It is an honor to also witness the warmth of our neighbors – the people and the animals that we meet every day. We can walk our dogs, and be greeted by wonderful friends and neighbors who wave, stop and say hi. 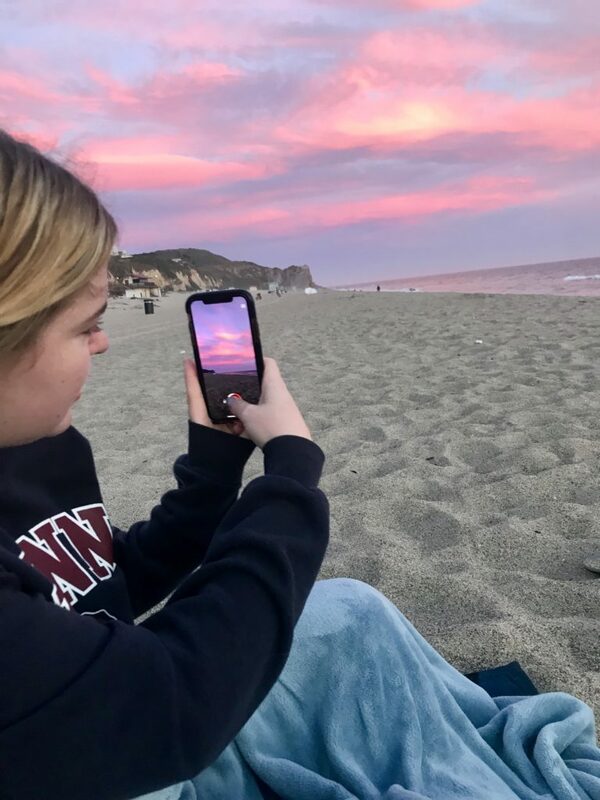 When we journey to Westward beach, we can can take in the sacred sunsets or even surf or run with whales, dolphins, sea gulls and pelicans. Thank you – all of Malibu for leaving a legacy of love in my heart and for teaching me not to take a day for granted. I will try to remember today and always, to savor every second I am here, to seek goodness and to be grateful for the miracle of the real Malibu. We made it through the 11/9 Woolsey Fire thanks to God, first responders and our garden hoses, but I am still emotionally scarred and feeling abandoned by our elected representative. When it comes to the Arts, Supervisor Kuehl is a great supporter, but disasters – not so much. Indeed, has anyone seen our Supervisor in Malibu since the fires on 11/9? It’s a sad day in LA when the the President of the United States visits to help us and to show he cares before our own elected representative. During my 5 days and nights helping in Point Dume during and after 11/9, everyone in the neighborhood kept putting out flare ups and helping others around the clock. I was humbled to witness so many people who never abandoned Malibu or neighbors in need. On Monday 11/12/18, many Malibu locals sprang into action and began a Point Dume Relief Center at the Point Dume elementary school. I stopped by around 2 p.m. and saw a neighbor who had stepped on a nail and needed a tetanus shot. I gave him a ride to Urgent Care and when we got there we were greeted by Dr. Jill Ferguson who explained she had been detained at a check point for 2 hours and now had no electricity because their generator ran out. I learned that the LA County Board of Supervisors would be meeting on Tuesday 11/13, and many of my friends asked if we could go there to ask for more support since we were abandoned. 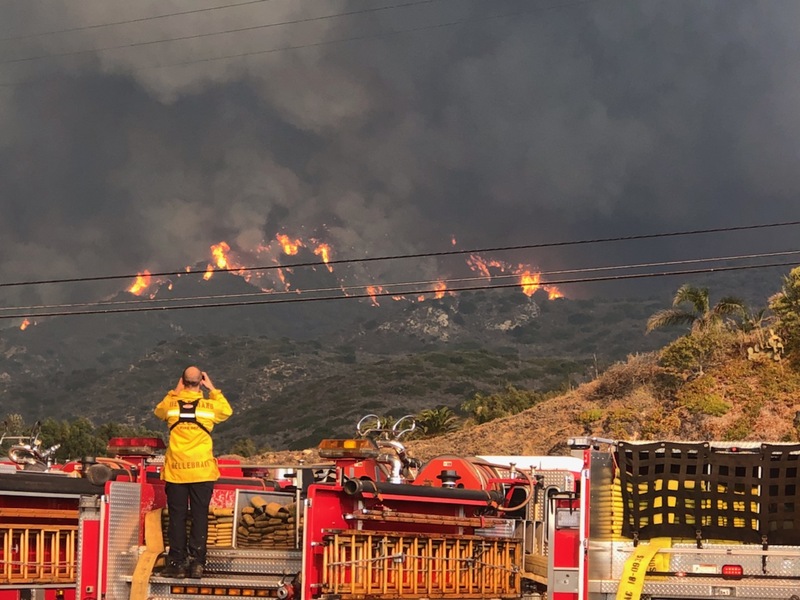 People were literally risking their lives to deliver supplies via boat to people who were still fighting fires in Malibu. “In 2007 when we had a tragic fire governor Schwarzenegger and Supervisor Yaroslavsky and the Sheriff were in a Malibu helping us fight the fires immediately. They walked through the devastation, and they stood up to help us in our hour of need. It was a tragedy, but the State, County and City worked side by side to help all affected. Today, we are alone. Where is everyone? Yes, we did have some heroic first responders who helped and we are forever grateful for their service; however, many were given orders to leave and not help. Armed only with garden hoses and a mighty heart, many of us saved our neighborhoods from total destruction after we were abandoned by LA county. It’s time to learn from the mistakes of the past and to do what we can, when we can to do better. The next disaster may not be in Malibu, it could be any where in LA County. I hope and pray our Supervisor will do a better job next time and will be just as willing to be there to support those affected as she was to meet singer Paul Simon. The week before Thanksgiving is usually filled with planning for a big Turkey dinner. Not this year. This week, the only thing I am concerned about is living in a state of Grace. I will be thankful for fresh air, clean water, family, friends and the chance to live out another day. I will check in with loved ones and give those I encounter a smile today. I will chose to live with compassion for those who have lost homes and family treasures. I will stay connected with my community and get curious and continue to ask “How can I help protect my community better in the future?” I will be courageous to question authority when necessary and have the confidence to bring truth to power. I will ask for clarity to identify how we can win battles in the future. In the past, we could rely on others to protect our lives and homes from destruction, but the paradigm has shifted. With climate change, drought and resources being stretched to the limit, we must reflect. We must be disrupters who think differently. We need to practice self-reliance and responsibility. We can no longer think we are going to be ok because someone will save us. Most of the us are out of touch with nature. We forget the natural ebb and flow of life. We don’t have to go to bed after the sun sets because we have electricity. We don’t have to notice which way the wind is blowing because we can shut our windows and close our doors and not have to worry. Not in Malibu. In Malibu, we live a “way of life” that is far different. In Malibu, yo-yo! This means “you are on your own”. We live with nature, we try to protect our homes fiercely with all our hearts, but we know that we are at the mercy of the wind and of nature. My heart aches for so many friends who have lost everything. The devastation is horrible. I have heard reports that nearly 600 homes are gone near Malibu. Point Dume and Malibu west were hit hard. Today, I thank God however for the many lives saved. The first responders put their lives on the line and I am grateful. 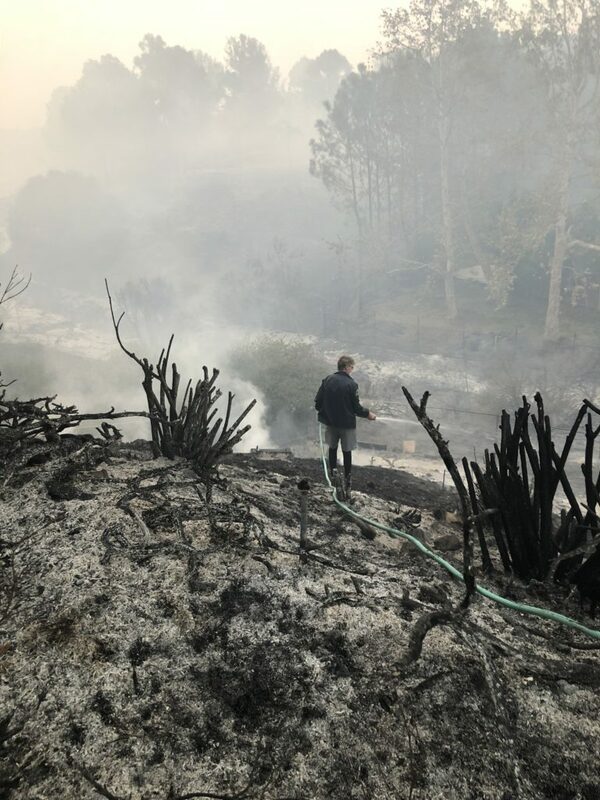 I am also so grateful for the many Malibu locals who took a “calculated risk” and protected their neighborhoods armed with mighty hearts, garden hoses, shovels, and wet rags. I am grateful for the way our community and many others around the country have come together to help those in need. I don’t know what tomorrow may bring, but I know in my heart it’s going to take a community and collective action to save homes and lives in the future. 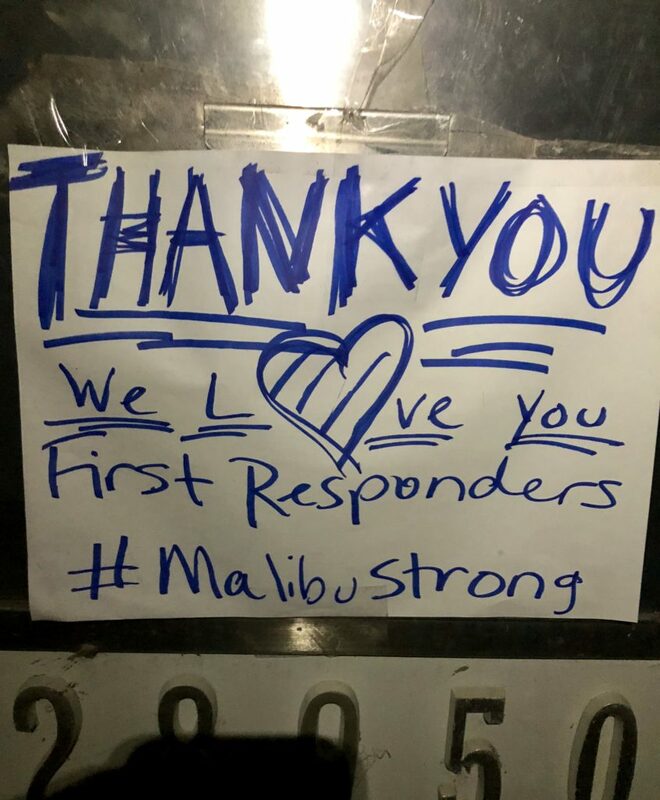 It may take years for us to heal and recover, but no matter what, we will stay #malibustrong! I experienced four burner “burn out” first hand, and wish I had heard about this theory way back in 2001. I had a demanding career as litigation supervisor at The Screen Actors Guild, was trying to raise a my 2 year old daughter and was pregnant with my second child and working on trying to stay healthy after weighing in at over 200 pounds. I had not seen many of my friends and had to repeatedly pass on many reunions over the years – so my friends burner was indeed out for all intensive purposes. I struggled to keep my career on high, raise my children and keep my husband happy and to keep healthy, but I physically and mentally was exhausted and knew deep down I could not keep burning these three burners on high. I asked to turn down the career burning by gong Part-time, but the Union refused saying it was a “dangerous precedent” to let me go part-time so I had to make a choice. My family or my career. I took the leap into the unknown and chose my family (and community) and my health burner and have kept those two burners on high for the past 17 or so years. In retrospect, I am still trying to come to terms with giving up my career as a lawyer. I wrote a book, which is really more like a love letter to my children, outlining my struggles with going from a working mom to a stay at home mom. It needs more editing, but at least it’s done. My daughter is now in college and my son is a Junior in High School. I am feeling the urge to reignite my third burner again and find myself writing this today. I am hopeful that this article will promote more dialogue and reflection. What’s on your stove?